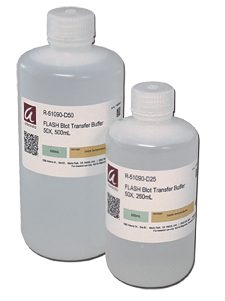 Compared to traditional transfer buffers, FLASHBlot Transfer Buffer provides improved transfer efficiency of all proteins, including those of high molecular weight for which is it often very difficult to achieve complete transfer. Complete transfer in less than 20 minutes. Transfer of CEA (high MW) and GAPDH (low MW) proteins was compared using FLASHBlot and Towbin transfer buffers. Following Western blot analysis, the data show equivalent protein transfer in 15 minutes with FLASHBlot vs. 60 minutes with Towbin buffer. Transfers with the FLASHBlot buffer can be performed with all traditional wet transfer apparatuses and take only 15 to 20 minutes. Transfer with FLASHBlot is better than both traditional wet transfer and semi-dry. 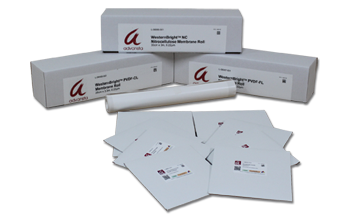 Faster than traditional wet transfers, and better than semi-dry. Transfer of Akt (60 kDa) Atcin (42 dKa) and bClxL (28 kDa) proteins by FLASHBlot was compared with a tradiotional wet transfer and semi-dry techniques. 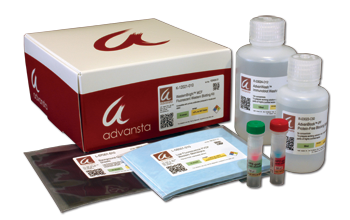 FLASHBlot transferred proteins more efficiently after 20 min than traditional transfer at 60 min, or semi-dry transfer (25v, 1.5a) for 12 min. 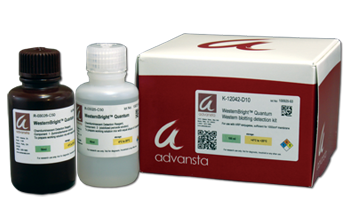 Due to the faster transfer time, FLASHBlot Transfer Buffer allows for increased protein retention on membranes resulting in more sensitive detection of low-abundance proteins. Shorter transfer times. 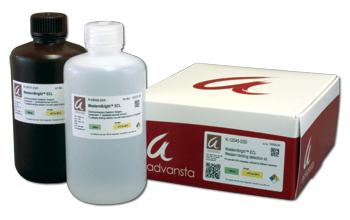 FLASHBlot achieves complete protein transfer in less than 20 minutes using any traditional wet transfer apparatus. More efficient transfers with FLASHBlot buffer. After 20-min transfers, Western blot analysis shows that both CEA and GAPDH are more efficiently tranferred using FLASHBlot buffer than using Towbin buffer. The short transfer times - plus increased transfer efficiency and protein retention - allow for sensitive detection of posttranslationally modified proteins, which can be difficult to detect after traditional transfer protocols. Superb detection of post-translationally modified proteins of interest. Western blot analysis of untreated and IFNα treated HeLa cell lysate using STAT1 and phospho-STAT1 shows efficiency of FlashBLOT Transfer Buffer. The blot was imaged with a CCD camera.